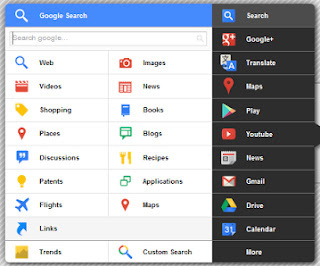 Now black menu can get you every Google’s service with a click. After installation of black menu in chrome you’ll get a new icon next to setting icon. On pressing that icon you’ll get dropdown list of Google services. You’ll get list of items when you move your cursor to any service. For example if you move your cursor to search you’ll see web, images, videos and other items. If you move your cursor to YouTube you’ll get a search box at top from where you can easily search for videos. Give black menu a try. I hope you'll like it.